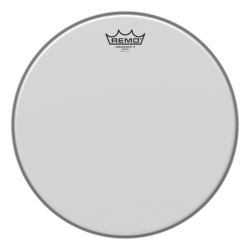 The Remo Ambassador Vintage is a responsive 2-ply drumhead that gives you a lot of tuning options. 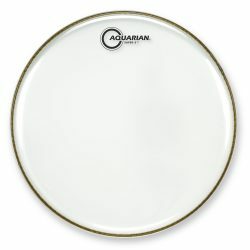 This drumhead is slightly warm and fat, with less overtones compared to the regular Ambassador. The Ambassador Vintage is great choice for toms and snare drums. 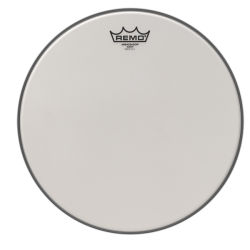 The Remo Ambassador Vintage is a 2-ply drumhead, made with one 7.5mil and one 3mil ply, plus a top coating. At 10.5mil thick, the Vintage Ambassador is one of the thinnest 2-ply drumheads available. 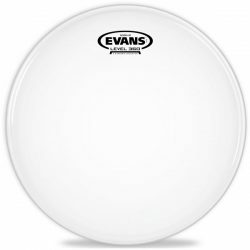 This means more sustain and responsiveness than most 2-ply heads, while allowing for a little more focus and control compared to single-ply heads. The result is a slightly dryer, fatter, and warmer version of a regular Remo Ambassador, with slightly less ringing overtones. Sound-wise, the Ambassador Vintage is on the warmer side of balanced. There is good representation of high, mid, and lower frequencies, with a little extra focus on the midrange. This drumhead is capable of giving a good moderate attack, with harsher high pitch frequencies dulled a little by the top coated layer. The resulting sound is fairly smooth, and sits well in a mix with other instruments. There is a moderate to high amount of sustain, and a moderate amount of overtones. The overall sound is relatively open, with a little more focus on the fundamental note when compared to a regular Ambassador. Overall, this makes the Ambassador Vintage a versatile drumhead that can be controlled more with dampening, or left open for more colourful tones. The thin construction means that the Remo Ambassador Vintage is very sensitive for a 2-ply drumhead. It responds well to lighter touches, which come through clearly. The Ambassador Vintage is great at both low and medium volumes, and is also usable on snare drums at higher volumes (especially when tuned up high). On toms, you’ll benefit from microphones on your drums if you’re playing in very loud environments… The smoother sound can get a little lost when there is a lot of other noise. 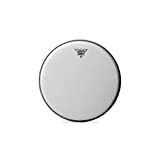 Remo Ambassador Vintage Coated Drumhead, 10"
Remo Ambassador Vintage Coated Drumhead, 12"
Remo Ambassador Vintage Coated Drumhead, 13"
Remo Ambassador Vintage Coated Drumhead, 16"
Cycling through the tuning range from low to high, the Ambassador Vintage performs very well throughout. The sound remains lively right down to a very low tension, with the deeper and warmer tones coming out more at the lower tuning ranges. When tuned higher, there is a little more ringing and a more cutting sound, which is great for louder drumming. 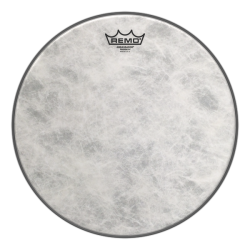 Overall the Remo Ambassador Vintage is a well balanced drumhead, with a fuller and fatter tone than a regular Ambassador, and less of the ringing that comes with single-ply drumheads. This is a versatile and responsive drumhead that sounds great on both snare drums and toms. The Remo Ambassador Vintage is usable with both drumsticks and brushes, with the top coating responding very well to brush strokes. This drumhead comes in sizes 8″ to 18″, and is only available coated.